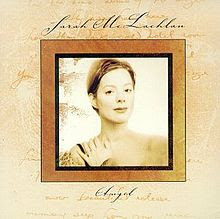 1) Sarah McLachlan wrote this song about someone she barely knew. She read the obit of Jonathan Melvoin, keyboard player for the Smashing Pumpkins, who died of a heroin overdose. What's the most recent news story that touched you deeply? 2) Ms. McLachlan performed this in tribute to Linda McCartney at the 1999 Concert for Linda. She was expressing her hope that, in death, Linda found relief and peace after a long and painful battle with cancer. What do you think happens to us when we die? 3) Daytime dramas General Hospital and As the World Turns used this song on-air after a major character died. 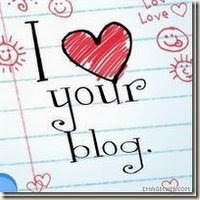 Do you follow any "soap operas?" 4) In 2007, Sarah donated her recording of this song to the ASPCA. Do you have a pet? If yes, how did you get it (shelter, pet store, etc.)? 5) She admits she can't watch those ASPCA commercials, where her recording of "Angel" plays over sad photos of animals. Is there a TV commercial that really gets to you (in either a good or a bad way)? 6) In 1994, Sarah was stalked by an obsessed fan. Tell us about a time you were really frightened. In retrospect, was your fear commensurate with the threat? 7) Sarah was adopted by Jack and Dorice McLachlan. Though she has a friendly relationship with her birth mother, she always considered Dorice her mother and sees herself behaving with her son the way Dorice did with her. Is there anyone in your family that you feel you resemble, either physically or by behavior? 8) McLachlan is one of the founders of Lilith Fair, a summer concert series designed to showcase talented female performers. Do/did your summer plans include an outdoor concert? 9) Random question: Which of these men would you most like to be seated with at dinner -- Clint Eastwood, Prince William or Jimmy Fallon? 1) Since we're not supposed to stop thinking about tomorrow, let's talk about it: What are your plans for Sunday? 2) Fleetwood Mac was formed 50 years ago in London. Fifty years is considered a "golden anniversary." Do you wear more silver or gold? 3) This song is from Rumours, which has sold 40 million copies. Is it in your collection? 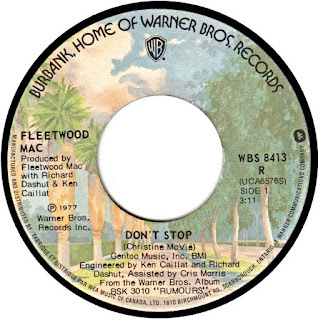 4) It was written by keyboardist and vocalist Christine McVie. She was born Christine Perfect, a name that earned her a fair share of teasing when she was a school girl. Do you recall being teased in school? What about? 5) Before Fleetwood Mac, she was in a band called Chicken Shack. If you were to order out for a chicken dinner, which restaurant would you turn to? 6) Before she could pay all her bills with her music, she supported herself as a window dresser for a London department store. Do you enjoy walking along, just window shopping? Or do you consider "looking with no intention to buy" a waste of time? 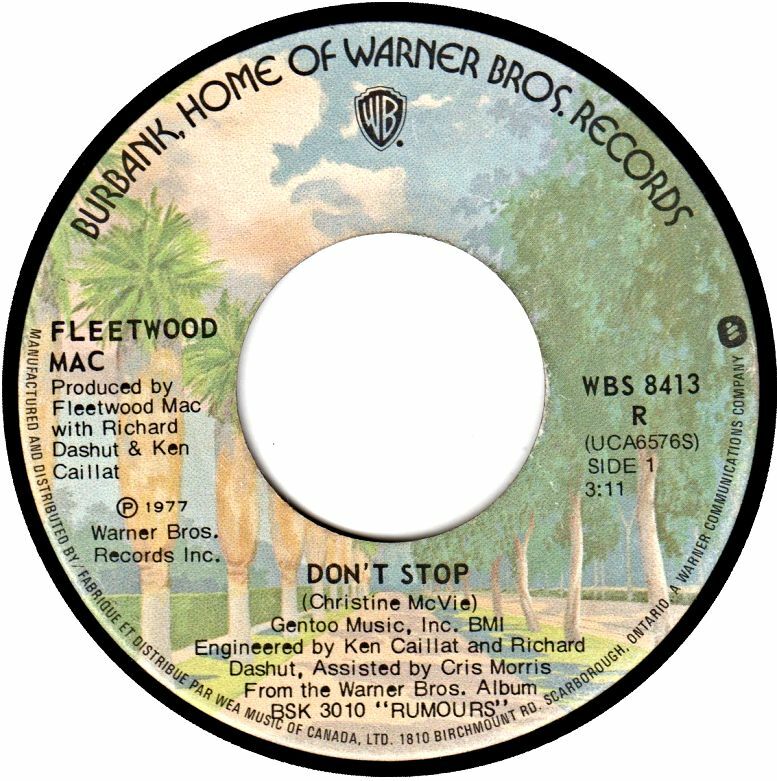 7) When she found herself making big money, one of the first things Christine bought was a pair of matching Mercedes for herself and then-husband, John McVie. If you were handed a check for $1 million, what's the first thing you would do with the money? 8) The other girl in Fleetwood Mac, Stevie Nicks, founded the Soldier's Angel Foundation. She believes in the healing power of music, and so she's proud to provide wounded soldiers with iPods already loaded with music. When you listen to music from your phone, MP3 player or iPod, do you use ear buds or headphones? 9) Random question: Let's pretend your high school reunion is coming up. Which classmate are you more curious about: the one who was your first date, or the one who was too cool to give you the time of day? 1) Fastball is a trio from Austin, Texas. Austin is the capital of Texas. When you were in school, did you have to memorize the state capitals? 2) Have you ever visited your state's capital? 3) Fastball played dates throughout Canada this past spring. When did you last leave the US of A? 4) Tony Scalzo is a founding member of Fastball. He's the singer in the video for this song, and that's his wife, Jennifer, playing the organizer of the speed-dating event. Have you ever gotten a job because you knew somebody? 5) In this pitch to a perspective lover, he admits he doesn't have much money. Last time you went to the ATM, how much did you withdraw? 6) He sings that at times, his mind is hazy. Do you have a good memory for names? 7) Fastball guitarist Miles Zuniga admits that he once had a crush on Carrie Fisher (aka Princess Leia). Tell us about one of your one-sided love affairs, either with a celebrity or someone you knew in real life. 8) Fastball's drummer Joey Shuffield is partial to drums from Pork Pie Percussion. This company was started by Bill Detamore, who began making drums as a hobby. Do you have any hobbies that, under the right circumstances, could make you money? 9) The fast ball is the most common pitch in major league baseball. Now that the MLB season is past the halfway mark, how is your baseball team doing? 1) In this song, Steve Miller claims he's a picker, grinner, sinner, lover, smoker and joker. Do any of those six words describe you? 2) He maintains he's still a midnight toker. When's the last time you got high? 3) The lyrics include a reference to peaches. Name your favorite fruit. 4) This song had a big impact on the character of Joey on Friends, who had an imaginary friend named Maurice with the occupation of space cowboy. Did you ever have an imaginary friend? 5) Steve Miller is the pride of Milwaukee, WI. What else is Milwaukee famous for? 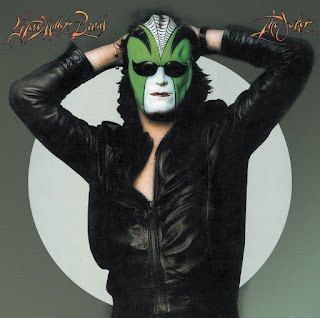 6) Steve Miller considers himself a serious blues guitarist. When did you last feel like singing the blues? 7) In 1973, when this song was popular, you could buy a portable 8-track tape player for $44.50. On what device do you listen to music most often? 8) A Curious George book packaged with a Curious George plush toy was a big seller at Christmas 1973. Tell us about a toy -- either given or received -- that brightened a holiday or birthday for you. 9) M*A*S*H was one of TV's top-rated shows in 1973. Who is your favorite M*A*S*H character?